Music as a gift was an important element to keep in mind. Creating a physical token lets you prepare the box as a gift for somebody else. In a way, it takes a lot from what we used to do with mixtapes but, in this case, the “mixtapes” are RFID tags linking to music online. This project was my final degree project and it was done in collaboration with Spotify. 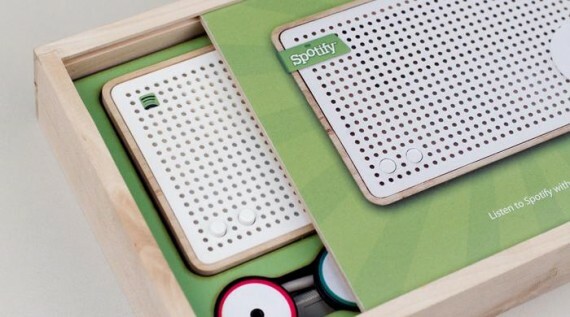 The initial goal was to explore the possibilities of using Spotify at home beyond its current software form. Even though smartphones and other devices are currently capable of running the Spotify service, sometimes the context doesn’t make it very convenient. When you are at home and want to listen to some music from Spotify, you still have to open the application on the computer or the phone and search what you want to listen to. Even though we have much more music to choose from, it is not as quick as and old school radio which only needs to be turned on and music would start playing. The current interaction model of what’s out there is the same as in the computer, but just in a smaller screen. This project simplified this process by exploring different ways to tangibly interact with the device. The approach was to prototype different interactions that would make this process more convenient in the context of the home. 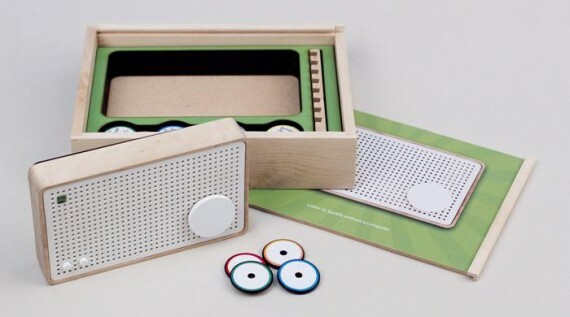 The initial constrains were to come up with an inexpensive tangible device that would take advantage of the benefits of a service like Spotify with a more analogue feel. We decided to work on basic Arduino prototypes to get feedback and iterate based on the different user tests that took part during the process. This project has been published in several magazines and online publications such as Wired, TechCrunch, CreativeApps, Gizmodo, The Next Web and Rolling Stone magazine amongst others. After the good feedback received, Nick Barkas (a software developer at Spotify) teamed up with me and we are currently working to port the current concept and industrial design to the Chumby hacker board. It is still a work in process, but we hope to build a few units or a DIY kit and open-source the project. We simplified the product to a minimum creating a very simple object. We used the Arduino platform to quickly prototype and iterate different ideas based on the feedback of people until we achieved a more refined concept. The final prototype is a proof of concept that uses an Arduino connected wirelessly to the computer to control the music. Even though the computer should not be needed in the final concept, the prototype was just meant to be used to try and demonstrate the concept. The way it enhances the interaction is by simplifying the process of choosing what music to listen to. The user would link different playlists to the different RFID tokens or prepare different playlists to give it to somebody else as a gift, this way, the playlist can be listened just by placing the token on the device. Except of the setup, all the interactions with the product were designed to be performed without the need a screen, becoming more limited but still quicker and more enjoyable. The only feedback strictly needed (low battery, internet connection issues) would be displayed on a led matrix behind the grid of the speaker when needed. The prototype was hand built at the school workshop, a detailed work log and the current status of the project is available online at blog.zenona.com.